Back in the day when I was a cool scene kid, me and my once upon a time friends used to plant our asses at Starbucks all day, and I always had to order a Green Tea Cream which totally complimented my cool cat cigarettes. Fast forward to 2016, I’m definitely no longer a cool cat, but I still really enjoy Iced Matcha Green Tea Frappés. 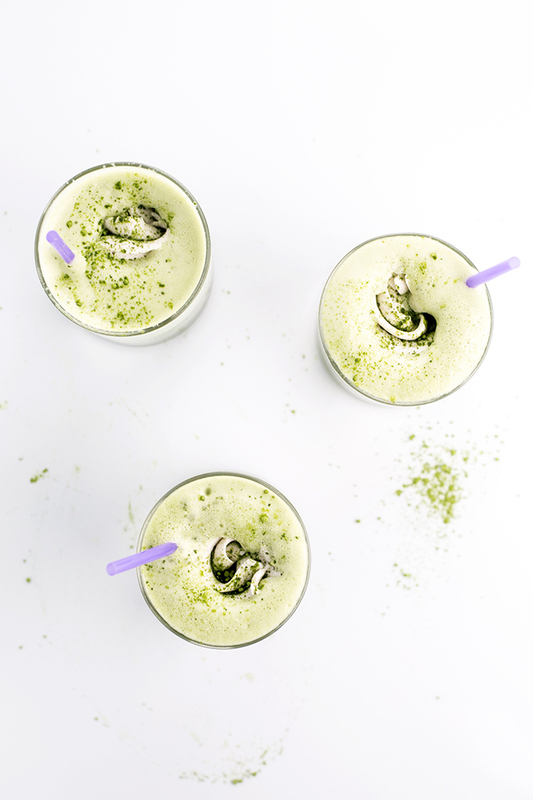 The recipe for my Iced Matcha Green Tea Frappé with Coconut Whip is dead simple to make – all you need is a blender and a couple of ingredients – Miss Matcha Green Tea, Soy Milk, Maple Syrup , Vanilla Bean, Salt and Coconut Cream (for the coconut whip). This Green Tea Frappé also happens to be Refined Sugar Free, Vegan (duh) and a lot lower in calories that the stuff I used to clog my young arteries with. Oh, it’s also Gluten Free hahahaha jokes. Anyway, there’s not much more I can say besides, try this recipe out. It’ll convert even Green Tea haters into Matcha Frappaholics. That’s a trademarked term, so don’t even think of copying me. 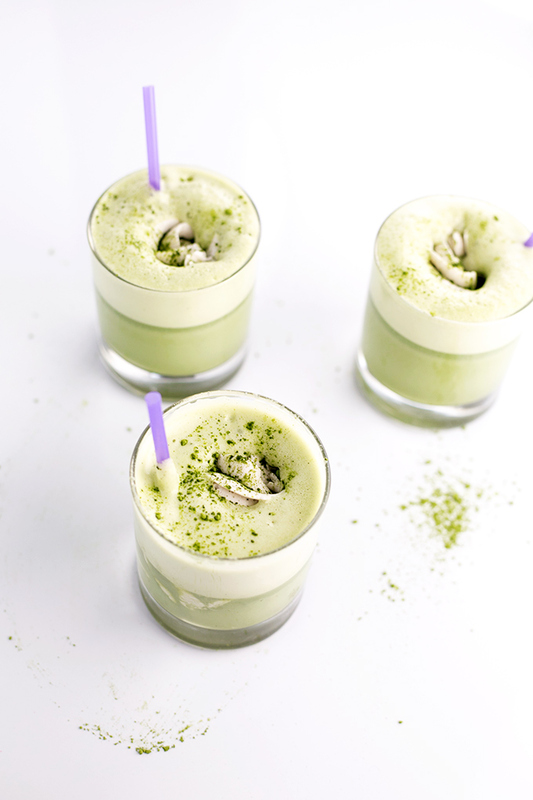 Scroll down for the full Iced Matcha Green Tea Frappé recipe. PS: Posts may be a bit erratic for the next 2 weeks because I’m off to London. Ciao x.
Iced Matcha Green Tea Frappés with Whipped Coconut Cream Topping. In a blender, combine Soy Milk, Matcha, Maple Syrup, Vanilla Seeds, and Sea Salt. Blend on high until frothy and completely smooth. Pour into glasses. In a small bowl, combine Coconut Cream, Maple Syrup and Sea Salt. With electric beaters, whip for a minute until it resembles whipped cream, about 1 minute. Either dollop or pipe Coconut Whip onto the surface of your Green Tea Frappe and dust with a little more Matcha powder before serving. Collect solidified Coconut Cream from a tin of chilled Coconut Milk. Coconut milk should be chilled for at least 6 hours - the solidified bits that form on the top of the can is Coconut Cream. 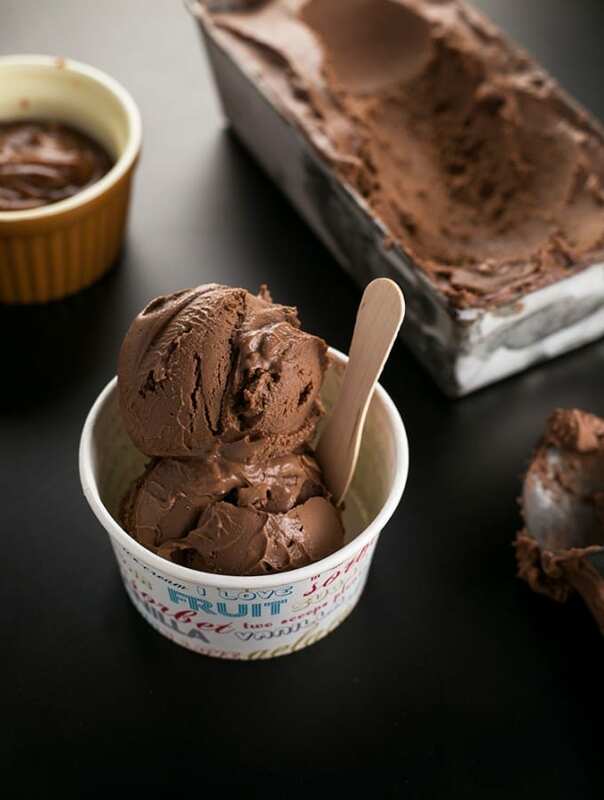 Kudos for not adding refined sugar! Maple syrup is perfect. Any thoughts on using honey instead of maple syrup? I love, love, love matcha! I had approximately one million matcha lattes in Thailand, and I'm trying to recreate them without all the sugar. I didn't even consider maple syrup. So, maple syrup, honey, what else? Thoughts? Hey Jen, I don't use Honey as I am Vegan. I personally think Maple Syrup tastes the best in such recipes as Honey tends to have a strong aftertaste, but feel free to use that if you want to try it out! Other alternatives are Brown Rice Syrup, Dates or Coconut Sugar :) Hope this helps! "In a small bowl, combine Coconut Cream, Maple Syrup and Coconut Cream" Did you mean coconut milk for one of them or is the coconut cream twice a typo? Sounds amazing either way! Hi there. I am looking forward to trying this but minus soy milk. All the research I have done and read about soy is just not good for us. I personally don't mind soy, but feel free to use any other non dairy milk! This green tea looks amazing, I love matcha, I haven't tried it iced yet, pinning this for later! Haha I like you am no longer the cool cat in 2016 that I was back in my Starbucks sipping days : )) Love this recipe! Need to try this! Thank you! Cool cats are dead! RIP! Your Matcha Green Tea Frappés look delicious. Have to try your version! Ooooh this looks wonderful! So refreshing and such a cool colour! No longer a cool cat? Says the girl who's "off to London" for 2 weeks! lol. Anyways, I just moved to Japan and green tea EVERYthing is EVERYwhere...but I'm still a green tea virgin. 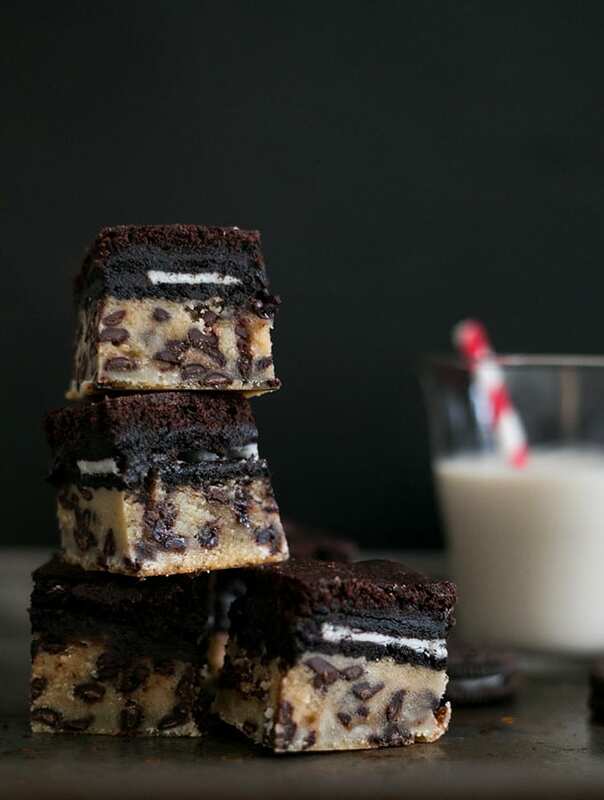 I think making these in the comfort of my own home might be just the ticket! I will definitely be trying this soon! Have fun in London! 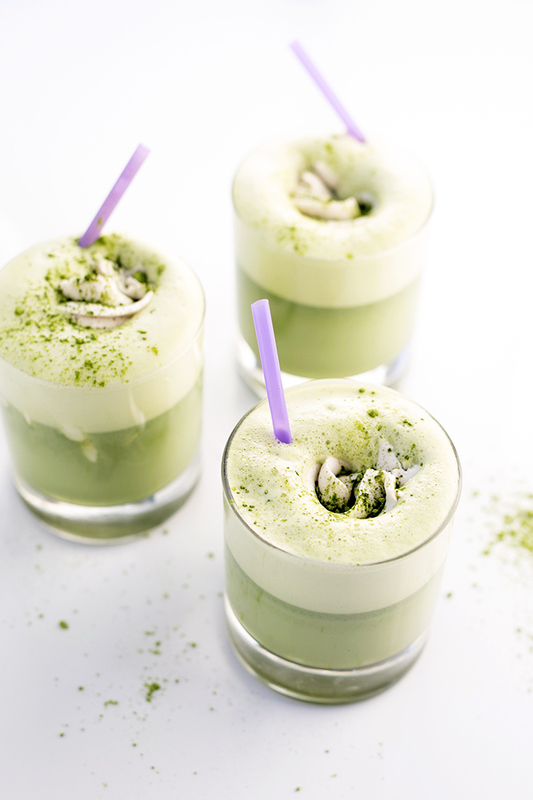 These look amazing - they're definitely inspiring me to take my matcha drinks up a notch! 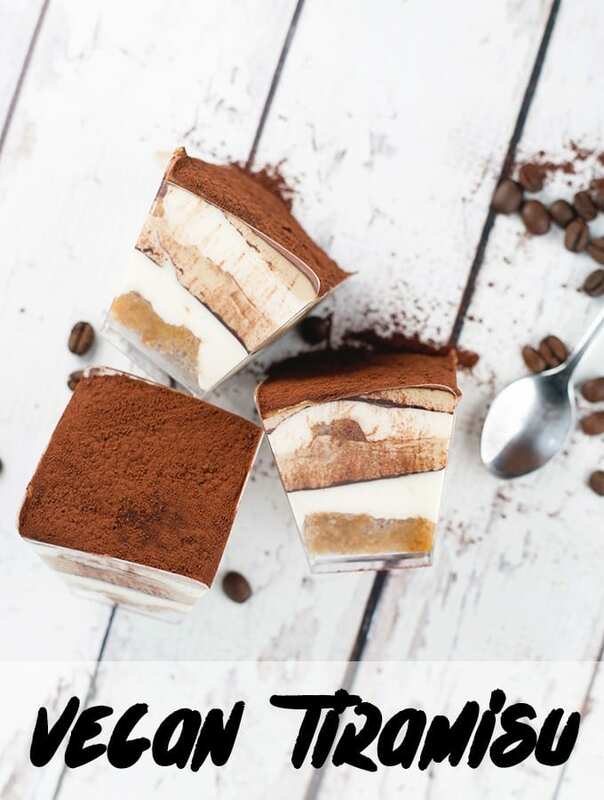 This sounds like an amazing alternative to the Starbucks original! Wow, this looks so beautiful--and refreshing too. On my MUST TRY list. 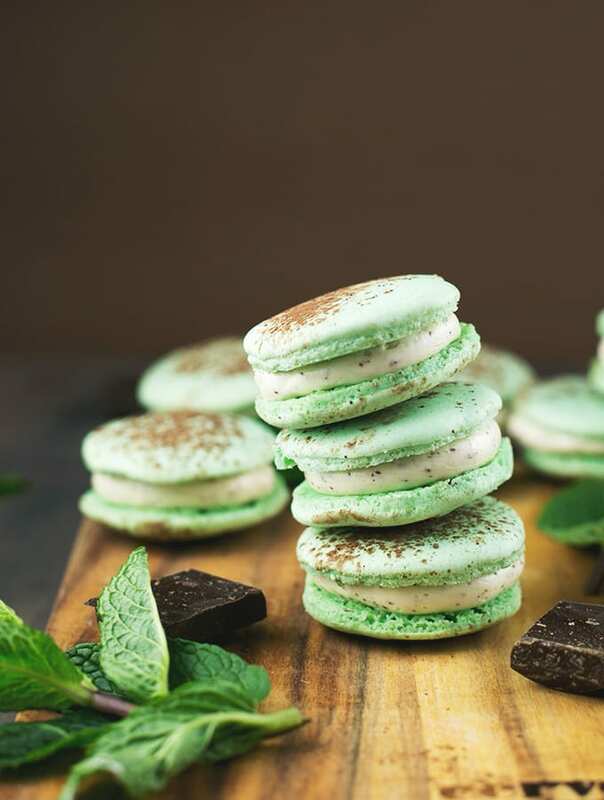 I am already a Matcha Frappaholic, but I'm thinking of all the money I'll save making your recipe instead! This sounds amazing! I definitely would love to try this! Ah, these look awesome!! I'm so stocked up on Matcha and need more uses for it! I may make an ice cream next!